In case you hadn't noticed, corporate ownership of New Order stock is all the rage these days. As of this moment, four corps are being listed in the month's "Top Supporters" list. Could this be a trend? Meanwhile, though, individuals continue to own the most shares. Kaely Tanniss upgraded her holdings of New Order stock with a purchase of 3,150 shares. 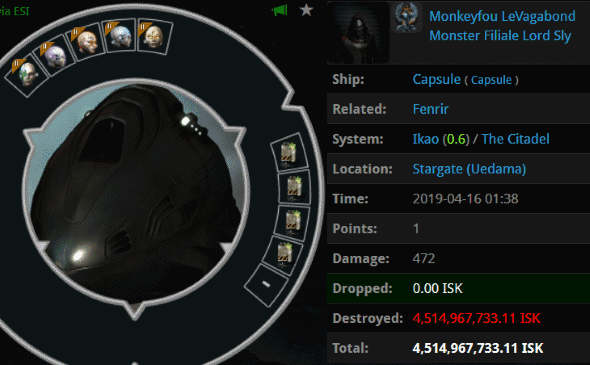 This took us past the 1,772, 1,773, and 1,774 billion isk marks, earning Kaely a Triple Supreme Protector's Tip of the Hat™. We're on the move. 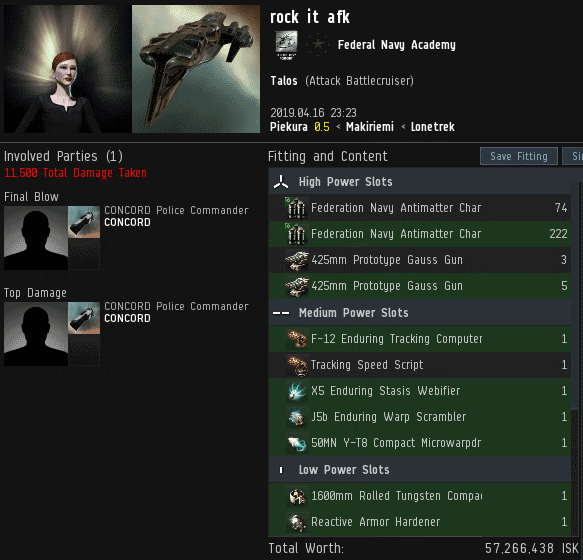 rock it afk got her Talos CONCORDed with a badly executed attempt to gank a nearby Venture, which she apparently suspected of providing warp-ins for gankers in the area. Incredibly, the Venture survived--so maybe it was secretly an Agent's scout. 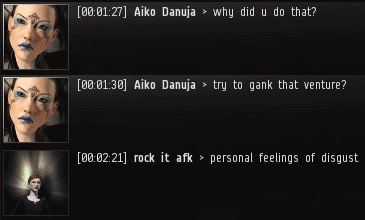 After the incident, Agent Aiko Danuja interviewed the Anti-Ganker/Fail-Ganker. It was a candid discussion. Rebellious carebears, ganking isn't as easy as we make it look. If you want to succeed at EVE, get yourself a permit and read the Code, ASAP. Previously, on MinerBumping... The mighty CODE. 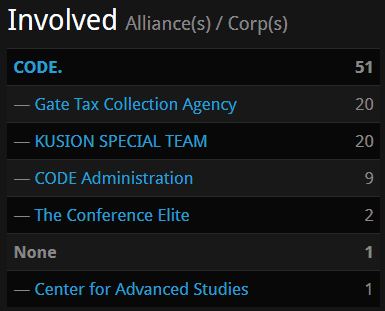 alliance did what it does best: Punishing Code violators in spectacular, innovative ways. 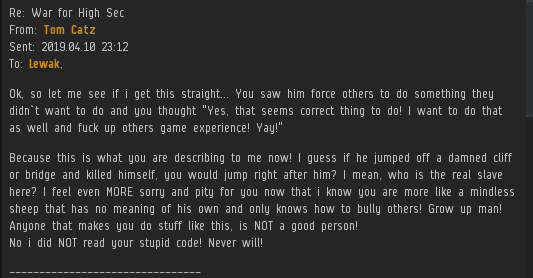 This drew the anger of an Anti-Ganker named Equ Snc, who was furious at CODE. for adapting to the various nerfs to highsec PvP. As Equ filled the Anti-Ganking channel with her complaints, she found herself opposed by Knowledgeminer, who urged her to git gud. ...Thomas en Chasteaux entered the fray. For half a decade, Thomas has been making unsuccessful attempts to organize an anti-Code resistance. He is notorious for being one of highsec's most long-term Goofuses. Knowledgeminer brushed off Thomas' warning and resumed his lecture about Equ's failures. 1. 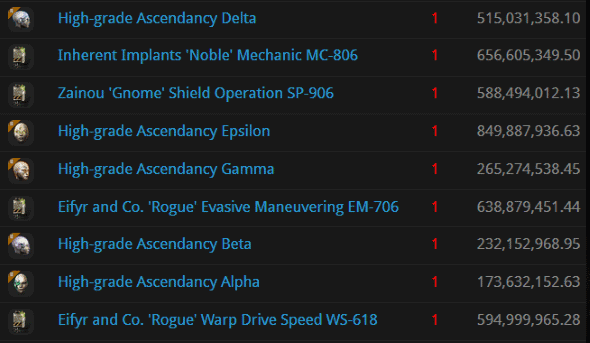 Begging CCP to make highsec 100% risk-free without nerfing highsec rewards. 2. Complaining that the risk-reward balance unfairly favors gankers. One may pity the CSM member who gets "petitions" from Anti-Gankers. 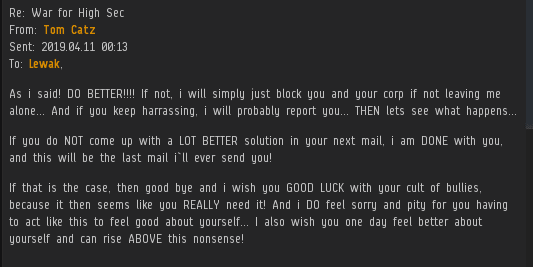 There's a silver lining, though: If Anti-Gankers spend their time petitioning CSM members, EVE's GMs get a reprieve from the nonsense. Countless carebears believe that CODE. and Goonswarm Federation are one and the same. Despite the passage of time, conspiracy theories about collusion between the two alliances have never gone away. Thomas decided that if anyone was going to beat Knowledgeminer in a debate, it would have to be him. He could not allow a heretic to preach in the Anti-Ganking channel unopposed. The truth is that when it comes to game mechanics, Anti-Gankers are always disingenuous. No matter how many times highsec PvP gets nerfed, they claim it needs One More Nerf™. Their endgame is absolute safety in highsec--which is why they're never satisfied by the latest nerf. For whatever reason, Knowledgeminer is still permitted to speak in the Anti-Ganking channel. However, many of the regulars have long since put him on block. Though Knowledgeminer bashed Equ and Thomas, he was not able to persuade his fellow rebels. Nothing changed. The truth is, Knowledgeminer wastes his breath. The only thing that has ever created real, lasting change in highsec is the Code. The Equs of the world cannot be talked into becoming productive citizens. They are hardened criminals who must be brought to justice. 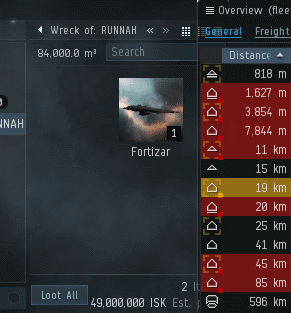 If you're a rebel who's tired of failure, there is but one path to happiness: Gank your fellow rebels and experience the joy of playing EVE the way it's meant to be played. The lessons of the Code are invaluable. Carebears have little cause for complaint when our Agents drop by and teach them how EVE is played. 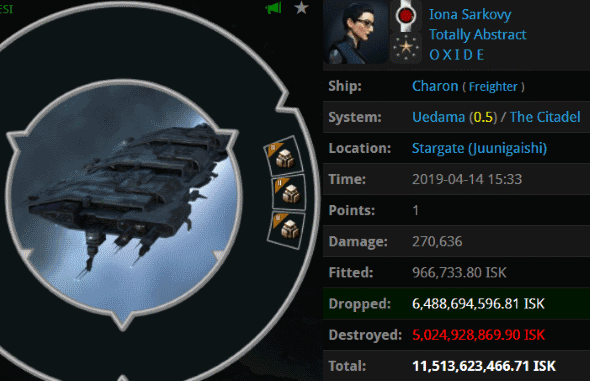 Instead of whining about their losses, the carebears should ask themselves, "What could I have done to avoid being ganked? How could I have been more faithful to the Code?" Anything else is folly. Let's examine a few of the lessons that were taught during the week of April 14th @ 00:00 EVEtime through April 20th @ 23:59 EVEtime. Judging by the bulkheads she fit, Iona Sarkovy knew her freighter would be in danger if she went to Uedama. Perhaps she assumed that our Agents would prefer to gank a freighter with fewer hitpoints, and that hers would be overlooked. If so, she seriously misjudged the firepower of our Agents' gank armadas in 2019. Agents Taxman Daniel, Tax Collector Max, Tax Collector Richard, Tax Collector BokChoy, Tax Collector HongMei, Tax Collector Kittens, Pod Destroyer Molly, Tax Collector Aruka, Tax Collector Hill, Tax Collector Stroheim, Tax Collector KarlMarx, Tax Collector AynRand, Australian Excellence, Tax Collector Fuemi, Tax Collector Buck, Tax Collector Kimi, Tax Collector Shardani, Tax Collector Alison, Tax Collector Yuna, and Tax Collector Larry won the battle with a dozen Taloses and several Catalysts. Due to all of our freighter ganks, highsec's hauler pilots are increasingly switching to other kinds of ships to move their contraband. But as Alena McJenkins learned, this strategy is highly risky. 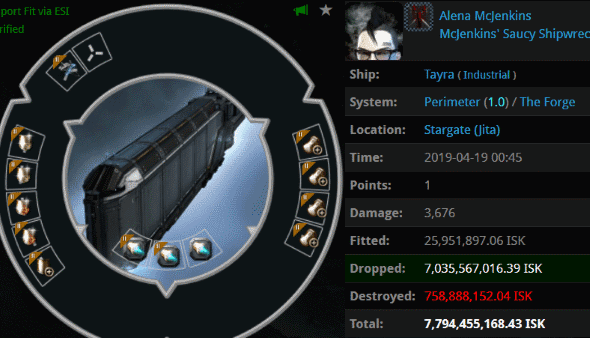 Alena loaded up her tech I hauler as though it had hitpoints to spare. 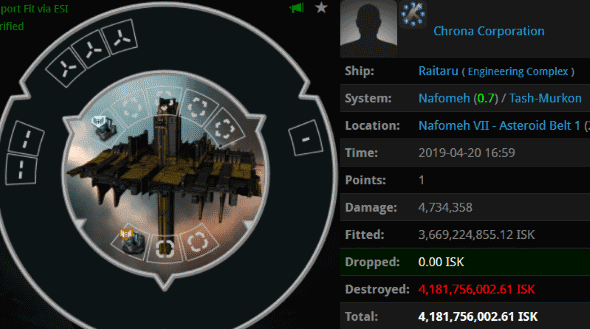 Agent Gogela was able to pop this 7.7 billion isk ship all by himself, and in a 1.0 security system to boot! Our Agents have upped their patrols of 1.0 security systems--to great effect. 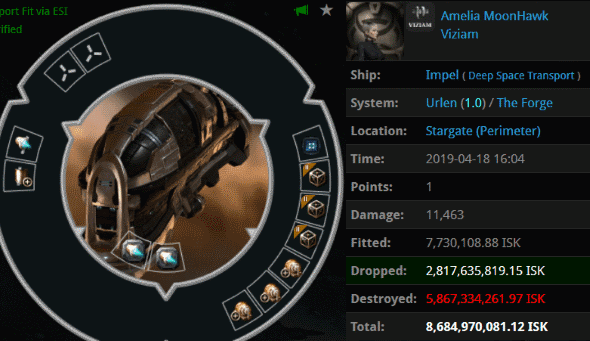 Amelia MoonHawk lost 8.6 billion isk in a flash when her Deep Space Transport was blapped by a group of Tornadoes piloted by Agents Gandor Ironfist, iZaEaRl, and Spazmongloid. Nowhere in highsec is safe for the Code violator. 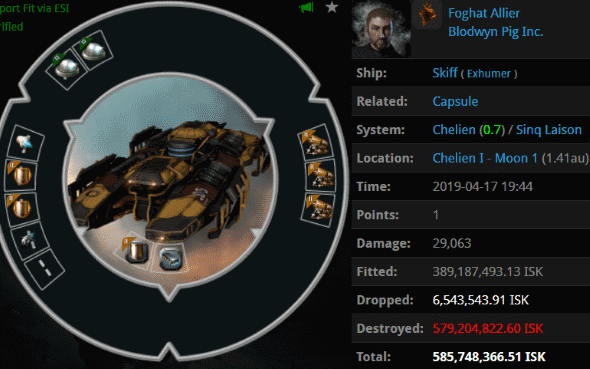 We've seen plenty of blingy Skiffs that had a lot of tank modules, but Foghat Allier opted not to add too many hitpoints to his mining ship. I wonder if Foghat secretly wanted to be ganked by Agents Maximus Gooseman, Yamadutas, Misha Mawashi, Lewak, Gagah Enforcer, Araena Calorne, Eva Mavas, Elana Sabezan, Eduard Limonov, Edmund Sublett, and Salah ad-Din al-Jawahiri. I mean, come on--ORE Ice Harvesters? Chrona Corporation found itself at war with the mighty CODE. alliance after the corp failed to recognize the Code as the supreme law of the land. Every wardec is an opportunity for another CODE. victory, and this one was no different. Agents Aaaarrggs Scout Alt, Aaaarrgg, Pod-Goo Repoman, Pod-Goo RepoWoman, Pod-Goo Repairman, and Hek Arbosa assembled a strike force of Leshaks and Guardians and took down the enemy corp's unlicensed Engineering Complex. That's a lot of CODE.! Then came the race to gank Monkeyfou's pod. The winner was Agent brainlet, who timed his smartbombs with the precision we've come to expect from such an elite PvP'er. As it happened, Monkeyfou's pod was worth even more than his freighter. But even more valuable, of course, was the lesson: No permit, no ship--and no implants. Another day, another glorious victory--or two, or twelve, or fifty--for the New Order. The mighty CODE. alliance smashed an unlicensed freighter cruising through highsec. Its pilot was almost certainly AFK at the time. That may seem like a lot of CODE., but these days giant CODE. fleets are common. Bot-aspirants can't build a ship that we don't have the firepower to destroy. With so many CODE. 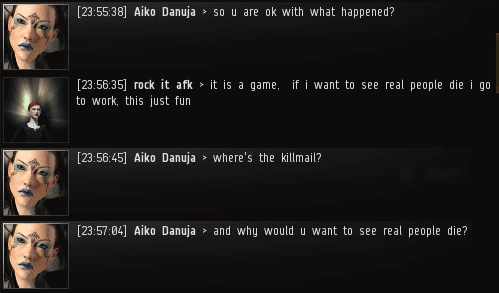 in that system, where was Anti-Ganking? The anti-Code rebels are powerless to stop our brave, elite warriors. Our Agents' biggest problem: What to do with all of the loot. When this particular freighter exploded, it dropped a nice, fat Fortizar. But surely the Anti-Gankers could at least interfere with the looting of such a large cargo? In the pre-Crimewatch days, a ganker could send his own freighter to loot the wreck. Under the old rules, only the wreck's owner (i.e., the gank recipient himself) would be allowed to shoot the looter. That system made it very easy for the ganker--or anyone else nearby--to loot wrecks without retaliation. 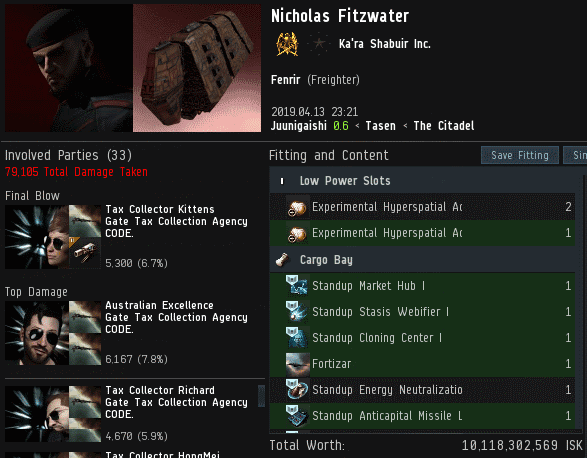 CCP eventually changed the rules so that anyone could shoot a looter. In theory, an Anti-Ganker can trap and kill a ganker's freighter when it tries to loot a fat wreck. So the gankers adapted--as usual. ...And the Anti-Gankers whined. As usual. Anti-Ganker Equ Snc was furious when she learned that gankers had found a way to more effectively transfer large amounts of loot from wrecks. It still involves substantial risk on the part of the ganker, but anti-Code types want ganking to be impossible. As we've seen in previous posts, Knowledgeminer is known for skewering his fellow rebels for their incompetence, laziness, ignorance, and bad attitudes. It's a wonder the Anti-Gankers keep him around. Probably due to a shortage of rebels. Equ Snc wasn't willing to be silenced without a fight. Without a fight in chat, at least. Previously, on MinerBumping... 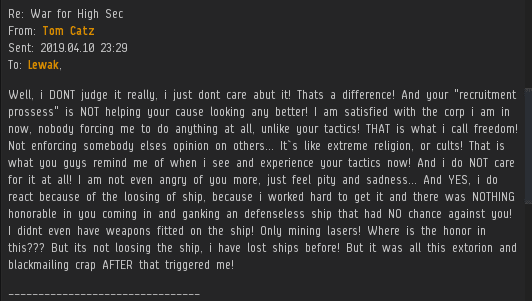 Some miners rant and rave when they lose a mining barge. That's to be expected, I suppose. But when Tom Catz lost his Retriever, he bombarded Agent Lewak with a seemingly endless series of ranting EVEmails. Despite a dead barge and a bundle of wisdom courtesy of Agent Lewak, the miner was no closer to buying a permit. Tom simply couldn't understand what motivated the ganker. Our Agent, of course, was totally open and transparent about why he did what he did. The New Order has no ulterior motives or hidden schemes. The Code can be downloaded and read by anyone--and it's available in ten different languages. Tom's problem is that he wouldn't read the Code. No wonder he was so confused. Lewak urged the miner to simply read the Code. It would be smooth sailing from there. Alas, Tom preferred to experience one emotional meltdown after another. Looks like he's another one of those "relaxed" miners. As it so often does, compassion filled Lewak's heart. But it was doubtful that the miner would appreciate it. 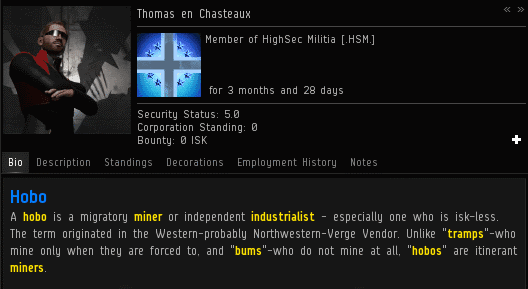 Tom confessed that he didn't care about anything but mining for the purpose of grinding isk. He was a bot-aspirant. Yet even a hardened bot-aspirant can be rescued by the power of the Code. Tom could turn his life around. And if he didn't, he was 100% responsible for the consequences. Tom insisted that the two needed some way out of their stalemate. Rather than making a reasonable proposal (like offering to obey every provision of the Code), he asked Lewak to come up with something. Agent Lewak dug deep: He was willing to sell the miner a permit for only 10 million isk. In an odd bit of negotiating, Tom made a unilateral offer to leave Lewak alone--something he'd previously suggested would require Lewak to do the same. 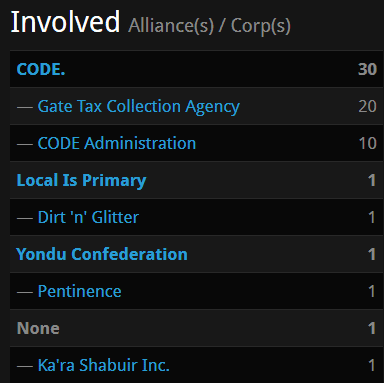 Unfortunately for Tom, the talks concluded with the miner continuing to be a target for Code enforcers everywhere in highsec. Our Agent had refused to compromise his principles. Another victory for the Code!